I know this post is two weeks overdue, but now I finally get to talk about what was easily the most hotly anticipated movie of 2012. It has been 8 years since Batman (Christian Bale) has taken the fall for the death of Harvey Dent. In the meantime, Gotham City has adopted the Dent act which has put away a significant number of the important players of organized crime. However, nothing could prepare them for the advent of the terrorist known as Bane (Tom Hardy). Now, it seems like Bruce Wayne will have to take up the cowl of Batman once again. Though he might have unlikely allies in Catwoman (Anne Hathaway) and Officer John Blake (Joseph Gordon-Levitt), could he defeat the biggest menace Gotham has ever seen? Even with other hotly anticipated movies like The Avengers and The Amazing Spider-Man still eating at ticket sales, The Dark Knight Rises is topping the box office. Does it live up to the hype though? I will admit that, like The Amazing Spider-Man, the villain was a little bit of a letdown. Bane simply wasn’t the force that Heath Ledger’s Joker was in the earlier film, but then again the film ultimately wasn’t that focused on him. Much like the first film in the trilogy, Batman Begins (2005), The Dark Knight Rises was primarily concerned with Bruce needing to overcome his own personal demons to get the job done while The Dark Knight (2008) gave the Joker plenty of screen time (though ironically intentionally keeping him largely undeveloped as a character). Bruce still feels the hurt from the death of Rachel Dawes in the earlier film. Bruce struggles with the possibility that the world may actually not need Batman anymore. On top of that, it turns out that Bruce has to deal with consequences of his own actions from the first film. 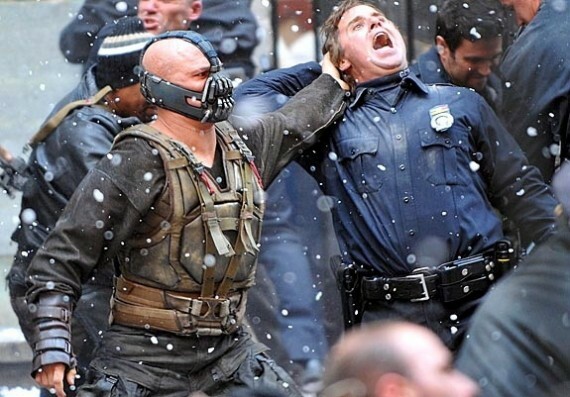 Overall, The Dark Knight Rises features some very tight direction with some generally good performances all around. Christian Bale never was my favorite Batman (Michael Keaton is still the best in my book), but I think he doesn’t really deserve a lot of the flak people give him especially for the Kevin Conroy-esque voice he puts on as the Caped Crusader. He held his own throughout, and I thought Bale’s acting has improved, if anything, from the previous films. Similarly, I was never really a fan of Anne Hathaway, but I thought she did a good job as Catwoman. Sure she was no Michelle Pfieffer, but she never set out to be. On the other hand, I very much am a fan of Marion Cotillard, but I thought her turn as Miranda Tate was definitely one of the weaker performances I have seen her give. I think the problem with Cotillard is that she simply cannot lose enough of her accent to convincingly play a non-French character, and for that reason I always thought her acting in French movies was better than it was in American ones. It was also interesting seeing Joseph Gordon-Levitt is very much on his way to becoming a serious actor and that Matthew Modine (notably known for playing James T. “Joker” Davis in Full Metal Jacket) has come out of retirement from a largely unimpressive career. Christopher Nolan’s vision as a director was what really helped everyone’s performance throughout. That said, there were a few things I found a little problematic with the movie. For one thing, I thought the voice effect for Tom Hardy’s mask garbled more than a few of his lines, rendering his dialogue less intelligible than Christian Bale’s ever was. Also, I thought the entire subplot involving Alfred (Michael Caine) felt like an afterthought. Finally, why the hell did Cillian Murphy (Scarecrow) feel the need to appear again? I think the word “paycheck” is the best way to answer that question. Despite said flaws and a couple plot holes, The Dark Knight Rises ties with The Avengers as the best movie of 2012 I have seen so far. As a dark, character-driven drama, The Dark Knight Rises was the perfect flipside to the special-effect-filled fun Avengers on the superhero coin. I agree with mostly everyone else that it wasn’t quite as good as its predecessor, but I thought it was still a terrific way to end what probably was the most significant trilogy of the early 21st century.